“The organism is not an individual but a social mechanism—always bringing us at last to cells.”—Virchow. “ It is a valuable method in physiological science to reduce a problem to the simplest terms possible. A unicellular organism is millions of times simpler than a human body ; still all fundamental functions and processes, such as nutrition, growth, reproduction, excretion, appear similar in both. Hence by studying the influence of alcohol upon these functions in simpler organisms, evidence may be gained bv which more clearly to interpret the human experiment.”—Prof. C. F. Hodge, Ph.D., Clark University, America. In discussing the action of alcohol upon the body, we shall so constantly use the word “cell,” and refer to the “ protoplasm ” of which it consists, that it seems essential to introduce here a few words on the subject of cells and cell-life, and on the protoplasm which forms the basis of every part of our actively living body. The bodies of all plants and animals are built up of very small forms of matter called cells. Some microscopic animals, the very smallest that we know, consist of only one single cell which has all the work to do—the feeding and excreting, the moving and the feeling. But by far the greater number of animals are built up of many thousands or millions of these cells, and when there are so many the different duties are distributed among them. This is, of course, the case with our own bodies, which are built up of many many millions of these cells arranged in organs, each with its own duty to perform. 36 ALCOHOL AND THE HUMAN BODY chap. they are normally working as they ought, and also when there is something which is interfering with that work. In the simpler forms of life cells are few in number, in fact, in the simplest form of all (e.g. the amœba and certain bacteria) the animal or plant, as the case may be, consists of one cell only, which carries on all its functions in a complete though elementary way. Inasmuch as it is the life of individual cells which forms the ultimate basis of the complex phenomena constituting the life of a human being, we do well to study the structure of these very simple forms, such as the amœba, seeing that the foundation material of which all cells are made is indeed the same, and that in these primitive forms we can more readily follow out that life-history, which after all is the type of the life-history of all cells, however complex their structure and function. Moreover, in these simple forms we can study with especial accuracy the effect of foreign substances upon the protoplasm which is the substantial basis of all cell-life. The animal organism known as the “ amœba ” is a minute particle of jelly-like material which lives in stagnant water, and can be seen if a drop of such water be examined under the microscope. It is capable of slow movement, pushing out processes, first in one direction and then in another. Careful watching shows us that the amœba absorbs (or takes in) tiny particles of food, and also excretes (or gets rid of) its waste material and anything it does not need. Further. it has the power of dividing, and thus producing a new generation of amœbæ. Fig. 6.—The drawings are taken from two specimens of an amœba. That on the left hand shows the animal actively throwing out processes by which it drags its body from place to place. That on the right, a group of four figures, shows the various shapes a, b, c, d, successively assumed by an amœba while under continuous observation under the microscope. From Practical Zoology (Marshall and Hurst), by kind permission of Messrs. Smith, Elder, and Co.
water. The term protoplasm, or living protoplasm, implies always a power of life, vitality, and change. In the centre of the small mass of jelly which forms the amœba is a rounded body which we term the nucleus, also consisting of protoplasm, the survival of which is essential to the life of the cell, as it takes the leading part in the sub­ division and multiplication of the cell. We shall see later how both the body of the cell and its nucleus are each affected by alcohol. 38 ALCOHOL AND THE HUMAN BODY chap. As we pass higher up the scale of life we find an enormous increase in the number of cells required to form an animal. In these higher forms certain cells are set apart in groups for certain objects, and consequently we find some of them manufacturing special juices, some entirely concerned with carrying messages to the brain, some acting as blood-cells, and so forth. For this reason the mere outside appearance of cells is very various (see diagram), but we wish to emphasise the point that, in spite of difference in shape and size, the founda­ tion of all cell-life is the same, namely, protoplasmic; and that it is exceedingly important for the protoplasm of each in­ dividual cell to be vigorous, in order that complete life and health may be experienced by the organism as a whole. It is not altogether easy to picture at one moment the in­ dividual lives of tiny cells, and then to think of them as massed together and acting together in thousands, forming the organs and tissues of the body. Perhaps the best way in which to gain an idea of this question of aggregate cell-action is to imagine our bodies as being like a great nation consisting of many millions of people, working at many sorts of industries. Some of the inhabitants are concerned with the reception into the country of food and other raw material; the duty of others is to work up this food, so that it can be made use of by the people as a whole. Others, again, are concerned in the trans­ port or carrying of this material from place to place, others in its storage, and so on. It is the same with these cells of which our bodies are built. For instance, it is the duty of certain cells lining the stomach and bowels to take in food, whereas other cells are concerned in breaking it up, in storing it, as in the liver, or in passing it on, as in the blood-vessels, and so forth. 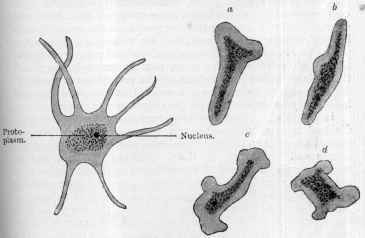 nuclei of which the cells consist. In the illustrations may be seen types of various cells, from the simple blood-cell to the complex brain-cell. If in any cells or groups of cells the normal activity and vitality of the protoplasm of which they consist is depressed by a drug, or by the presence of retained products of excretion, then assuredly the general level of vitality of the whole organ will be more or less impaired. In applying this fact, it is well, whenever thinking of the human body, to strive always to think in terms of the protoplasm of which the cells are actually made, and of the agencies and circumstances which affect protoplasm either advantageously or otherwise ; for the broader the view we gain of this subject of cell-vitality, the nearer shall we be to the understanding of those conditions which lead to good health and prolongation of life. We are now in a position to see first what is the general in­ fluence of alcohol on cell-life. 40 ALCOHOL AND THE HUMAN BODY chap. the cessation of the growth of the yeast plant when a certain amount of alcohol has been formed (p. 26). Of course, this is only an instance of the physiological law that the waste products of the cells of a tissue, by their accumulation therein, hamper, damage, and ultimately destroy (by degeneration) the cells themselves. This raises at once the question, In what way does alcohol behave towards living protoplasm so as to impair and dis­ organise its vital power ? The majority of protoplasmic poisons (of which alcohol is now recognised to be a very prominent one) have the power of primarily interfering with the all ­important oxygenation of the protoplasmic tissues. How far they actually assimilate by combination the oxygen which the tissues require is still an open question, but they directly interfere with the powers of these tissues to take up such oxygen as is available. In the case of alcohol, so great is its poisonous influence in this particular that the needed oxidation of the fats and starches taken into the body is interfered with in a most marked way, and with disastrous results in the shape of fatty degeneration and other maladies (see Chap. XIII.). Alcohol also apparently seizes upon a part of the invaluable oxygen in the blood, and the two form combinations, i.e. oxidation products, whereby some of the oxygen is prevented from ever reaching its normal destination. Interference then, with the fundamental (breath­ ing) function of living protoplasm is the first and most obvious way in which alcohol hampers and checks the vital activities of living cells. In order to arrive at further generalisations on this question, a large number of very important investigations have been made with regard to the effect of dilute solutions of alcohol upon the growth and activity of animal and vegetable protoplasm, and to these we must now refer in some detail, as they show what extremely small quantities of the drug exert an inhibitory and indeed fatal influence on the processes of life. glutinous masses which can be partially destroyed without the destruction of their vitality. The growth of this cell in the presence of dilute solutions of alcohol has been investigated by Professor Hodge, who has made a long series of experiments and reported the results. Solution in which the Torula was sown. alcohol. 1/1000 per cent alcohol. 1/100 per cent alcohol. 1/10 per cent alcohol. 5 per cent alcohol. Number of Torula Cells found in each Cubic Millimetre after seven hours. Thus we see that the active growth and proliferation of the yeast cells is greatly lessened even by extremely small amounts of alcohol, so that, whereas in the normal non-alcoholic solutions there were 2061 cells, in a mixture contain­ ing only one-tenth part of alcohol in a hundred parts of solution, the cells numbered only 852. In the words of Professor Hodge : “ The cultures containing no alcohol are seen to win.” A still stronger percentage of alcohol entirely prevents the growth of the yeast, and, as we have already pointed out in Chapter II., this stoppage of growth actually occurs in the manufacture of beer and wine, when the pro­ portion of alcohol reaches about 14 per cent, the organisms, like bacteria, being killed by their own life’s product— alcohol. 42 ALCOHOL AND THE HUMAN BODY chap. same amount of garden mould, water, and air, and he exposed all the tubes to the same conditions of light and heat. The liquid in the first tube was only pure water, the others contained certain weak solutions of alcohol. 2nd tube, water containing one part of alcohol in five thousand parts of water, i.e. one drop in about half a pint. Fig. 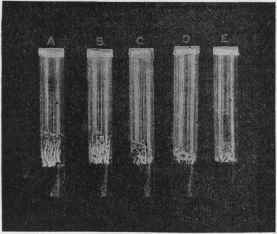 7.—Photograph by Dr. Ridge of the growth of cress in closed tubes containing garden mould (occupying the lowest fourth of the tube), with varying proportions of alcohol as follows :—In Tube A the mould was moistened with pure water only. In Tube B the mould was moistened with 1 part of alcohol in 5000 parts of water. In Tube C the mould was moistened with 1 part of alcohol in 1000 parts of water. In Tube D the mould was moistened with 1 part of alcohol in 200 parts of water. In Tube E the mould was moistened with 1 part of alcohol in 100 parts of water. The greater failure of growth accompanying the further addition of alcohol in each case is very marked. 3rd tube, water containing one part of alcohol in a thousand parts of water, i.e. one drop in about four tablespoonfuls of water. 4th tube, water containing one part of alcohol in two hundred parts of water. 5th tube, water containing one part of alcohol in a hundred parts of water. the first place, that the one part of alcohol in a hundred of water actually killed them, or only permitted germination to commence feebly (Fig. 7). The smaller amounts of alcohol simply retarded the normal growth of the cress, but even a drop of alcohol in more than a pint of water at times seemed to act injuriously. Seeds constantly soaked and watered with dilute solutions of alcohol have their growth retarded even by solutions that are much more dilute than the one per cent previously referred to. In addition to retarding the growth of the seeds, alcohol hinders the formation of their green colouring matter. These experiments have also been carried on with growing plants, as, for example, the geranium. Dr. Ridge found in the case of the geranium that both the growth and the production of the green colouring matter of the leaves are seriously affected by watering the plants on alternate days for a few weeks, with a one part in a hundred solution of alcohol. Two cuttings from the same plant were placed, as far as possible, under exactly similar conditions. One was fed with a one per cent solution of alcohol every alternate day, the other with water only, and after six weeks the one that had received the dilute alcohol was only about half the size of the other. Even one part in a thousand of alcohol was found to affect the geraniums adversely; there was less colouring matter in the leaves, and premature withering of the lower leaves occurred. In another experiment, when Dr. Ridge treated the common chara vulgaris with 1/10 per cent of alcohol (that is, about one drop in four tablespoonfuls of water), the plant began to lose its green colour. With regard to animals, it has also been proved that small quantities of alcohol are injurious to animal protoplasm. 44 ALCOHOL AND THE HUMAN BODY chap. alcohol, 1 to 1000, 2000, or even 3000, proved fatal to fresh­ water medusæ. Water from the tank of the botanical gardens, in which this little fresh-water jelly-fish lived, was collected in a jar and charged with one gramme of absolute alcohol to a thousand of water. A duplicate jar of plain tank water was placed side by side with the first, and in each a medusa was placed. On entering the jar containing the alcohol and water the medusa’s swimming movements were seventy ­four in the minute, but within two minutes these stopped, and the animal began to shrink and to sink to the bottom of the vessel. At the end of five minutes the little creature lay at the bottom apparently dead, and although it was put into plain water for twenty-four hours it did not recover. Meanwhile, the medusa in the other jar was active and unaffected. The experiments were repeated again and again, but they all resulted in proving that alcohol, even diluted to as little as one part of alcohol in a thousand parts of water, affected as a lethal poison the living protoplasm of these lower forms of life. The action of alcohol on simple, developing protoplasm as it exists in the eggs of insects, reptiles, etc., is very marked. The eggs of a blow­fly kept moist with alcohol and water, one part of the former to three thousand parts of the latter, do not mature as quickly as they normally should, and may not mature at all (Ridge). The same result occurs when the ova of frog-spawn is studied as the test object (Ridge). Water fleas (Daphne pulex) cannot survive more than a very short time when there is even only one drop of alcohol in four thousand of water, though they remain perfectly active and well in ordinary fresh water. Féré states that even in the case of hens’ eggs their de­ velopment is considerably delayed and disorganised by the presence of even small quantities of alcohol, when applied either in watery solution or as alcohol vapour. out numerous observations on the influence of alcohol in various strengths upon animal and vegetable protoplasm, using the alcohol as vapour or in watery solution, and noting its action upon various flowering plants, e.g. balsams, pelar­ goniums, geraniums, petunias, nettles, aloes, larches, begonias, potatoes, etc, and on various animals, e.g. hydra, tape­worms, earth-worms, leeches, cray­fish, perch, and other fish, sparrows and mammals, as well as man. He used much larger quantities of alcohol than did Richardson and Ridge, with the result that in most cases he obtained more markedly fatal effects. Using solutions of from 1 to 20 per cent strength, but working principally with a 10 per cent solution, he found that alcohol acts as a definite proto­ plasmic poison upon all the forms of cell-life upon which he experimented ; that plants become shrivelled and pale ; that animals become intoxicated, and that those that live in water soon die. Thus cray­fish, placed in a 2 per cent solution of alcohol, succumb within a single day; perch, placed in a 2 to 4 per cent solution of alcohol, rapidly become intoxicated, fall to the bottom of the vessel, and die, though if they are transferred to pure spring water before the last stage they may come to themselves in the course of a few hours. In reference to the previous experiments it is sometimes argued that organisms die if they are kept in distilled water (that is, water free from all mineral and other matter). This is merely tantamount to saying that an animal cannot live without food, and has nothing what­ ever to do with the question at issue. If it is desired to make a com­ parison between the action of distilled water and alcohol, it can be done as follows : a solution must first be taken in which the organisms thrive, and this must be divided into two parts. To one a small quantity of alcohol must be added, and to the other a small quantity of distilled water. The results must then be compared. It will be found that the organisms supplied with alcohol tend to expire, whilst those which are given merely an addition of distilled water, survive. These investigations clearly lead in one direction, all observers being now impressed with the fact that animal and vegetable protoplasm is deleteriously affected by even very small quantities of alcohol—which is, indeed, proved to be a drug which is very poisonous to living tissues and cell-life. The bearing of this upon the question as to the effect of relatively small doses of alcohol upon the protoplasm of the human body is obviously most important.